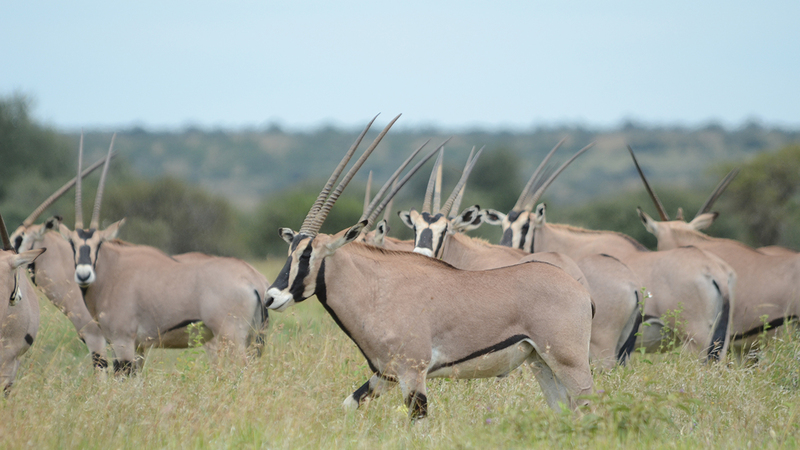 With long, straight horns and stunning face markings, the beisa oryx is unmistakable. Black lines streak across its nose, forehead, and down its cheeks, creating a mask-like appearance over its otherwise white head. Black badges mark its forelegs and chest. 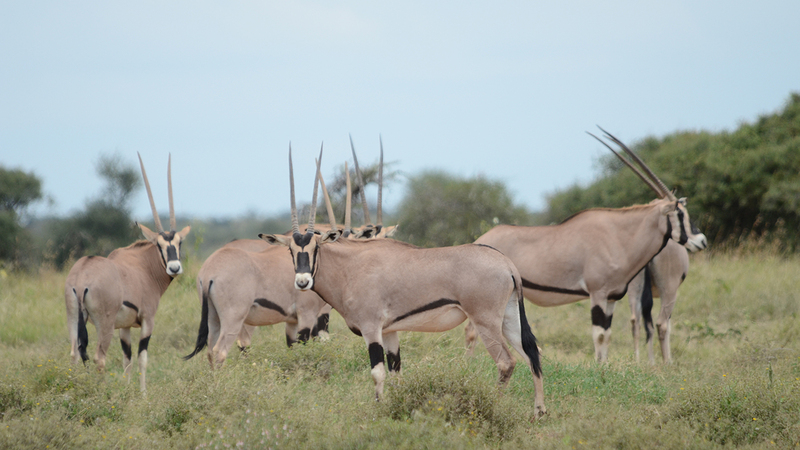 These patterns accentuate the oryx’s every movement and gesture and play a role in its complex social behavior. 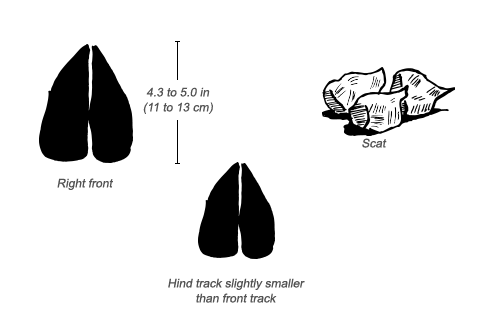 Tracks: Deep tracks; the two lobes tend to be widely spaced. How territorial are beisa oryx? Despite strict patrolling of their territories, male beisa oryx are actually remarkably tolerant when other males enter into their region. Of course, this is only true when there are no potential female mates around! Oryxes typically gather in herds ranging from 20 to 60 individuals, though herds as large as 200 can exist. Females spend most of their time with the herd; males occasionally spend time alone, although the majority stays with the mixed herd. Solitary males develop territories that they maintain by marking the boundaries with a unique defecation pattern. When females enter into a single male’s territory, he uses his body and horns to keep them in the center of his area. However, females will also mate with males in the mixed herd. Oryxes communicate with one another primarily through displays and gestures, emphasized by this antelope’s distinct coloring. A male conveys dominance with a head nod or an “ear-point” display, where he walks with head and horns held high and slightly turned, and his ears forward. He then twists his horns over to mimic a slow-motion blow in front of his opponent. The subordinate male keeps his head low and horns pressed down, then jumps away when the dominant male delivers his mock blow. Oryxes also use stares and postures to communicate. Beisa oryxes have declined dramatically in many areas across their range, due in part to hunting for their meat and hides and to their competition with livestock for food. These antelopes remain common in regions where livestock numbers are low. 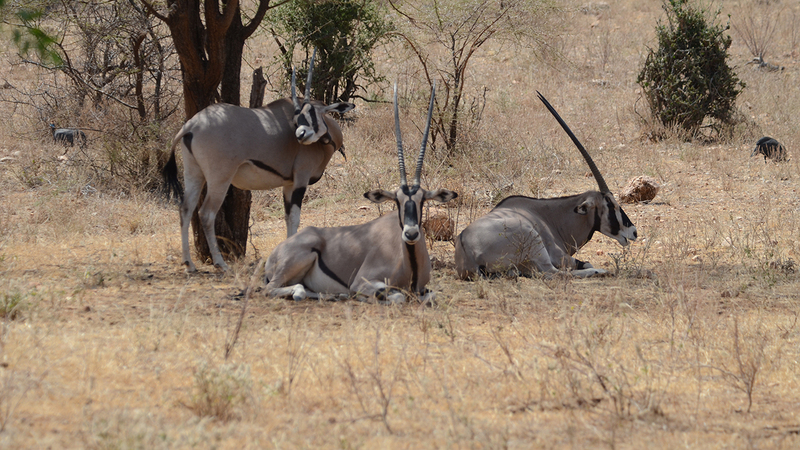 Only 17 percent of the total oryx population resides in protected areas. Although the beisa oryx once inhabited a large region throughout northeastern Africa, from Sudan to Ethiopia and down to Tanzania, its range has shrunk dramatically. It remains common in Ethiopia and northern Kenya. Beisa oryx live in arid and semiarid regions, especially bushland and grassland. 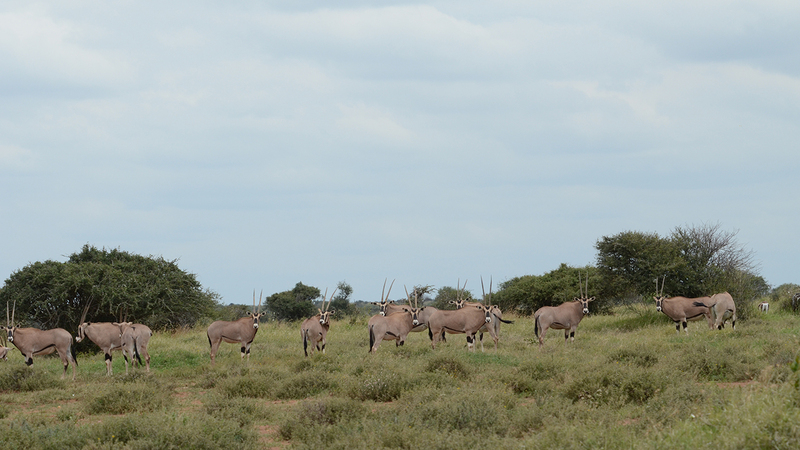 Oryx herds move based on the condition of the habitat. In the wet season, they move to high ground, away from tall grass and saturated areas. They will move great distances to find a satisfactory habitat. If an area is particularly suitable, they may stay for a few seasons. 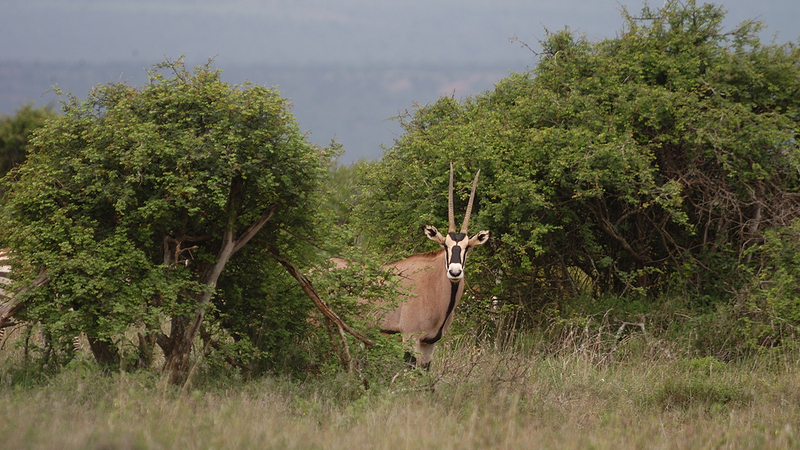 The beisa oryx is a grazer and enjoys feeding on a wide variety of grass species. During the dry season, they will partake in browsing and are even known to eat the poisonous adenium plant. Oryx feed at times of the day when plants hold the most water. A male oryx courts a female before mating with her. This courtship begins with an extensive circling of one another. If a female oryx does not want to mate, she may charge at the male or lie down in order to discourage him (though a male will try to encourage a reclined female by nudging her until she gets up). If the female is receptive, however, the circling escalates into a slow figure-eight or circular pattern led by the female. The actual process of mating is very short and quick. Oryx have a gestation period of 255 to 259 days and can give birth throughout the year. When a female is about to calve, she isolates herself from the herd. After birth, the calf hides for the first two to three weeks, during which time the female may rejoin her herd. Although oryx are prey to many large predators, including lions, leopards, and cheetahs, they are well-equipped to protect themselves. A herd of oryxes was observed confronting a pack of attacking African wild dogs by forming a semi-circle. When the dogs approached, the largest adult male oryx lunged forward, forcing the dogs to retreat. 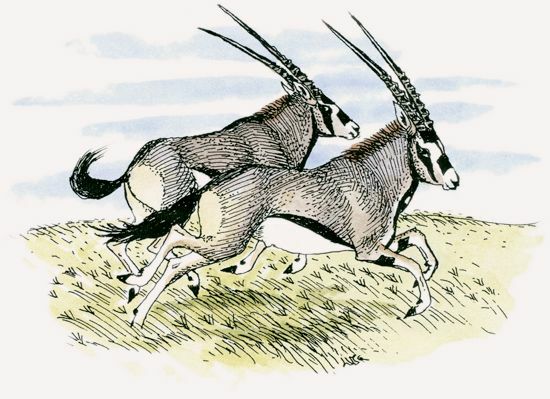 An estimated 50,000 beisa oryxes are sparsely distributed across their range. In northern Kenya, the Samburu District saw a 50 percent decrease in oryx numbers from the mid-1990s to 2008, though Laikipia has maintained a stable population. Serious fights between these large antelopes are rare and usually end with one oryx yielding and running away.